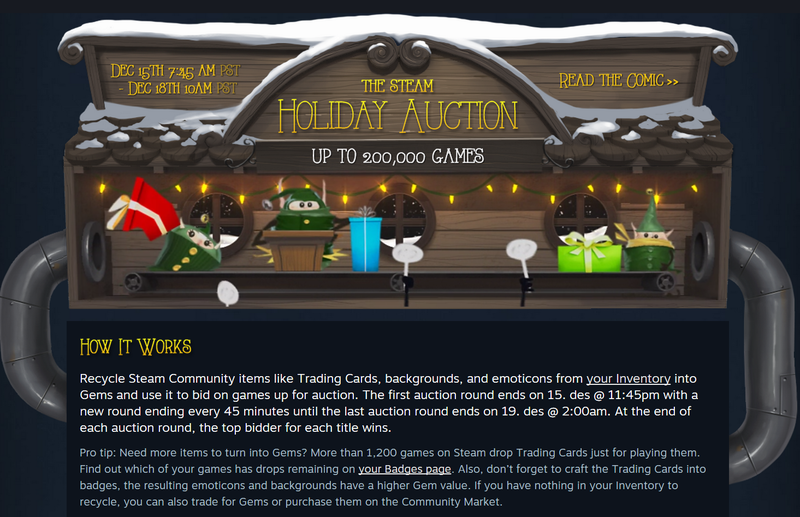 The trading cards you collect on Steam is now a bit more useful. Starting December 15, the Steam Holiday Auction will allow you to turn Trading Cards, backgrounds and emoticons into Gems, which you can then use to bid on 200,000 games in the Steam library. Now who says playing games doesn’t amount to anything? 😀 You can now just start collecting cards using your Steam Library and use them to bid for games. The auctions will run December 15 at 7:45am PST through to December 18, 10am PST. Each auction runs for 45 minutes with a different set of games per round — and since this is an auction, the highest bidder gets those games. And yes, Steam Holiday starts as soon as the Auction ends.